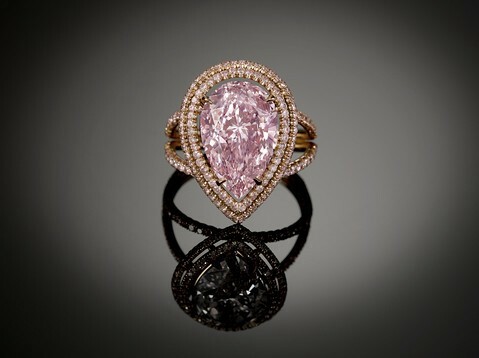 Behold, the Cassel Pink Diamond. Previously owned by the famous English banker and royal financial advisor Sir Ernest Cassel, this rare and absolutely stunning 4.71-carat purplish-pink diamond is surrounded by .79 carats of pink diamonds and set in 18k rose gold. Circa 1900, and yours for a mere $1.4 mil. Micromosaics were a hugely popular 19th century Grand Tour souvenir. They’re formed by vertically placing thousands of tiny, elongated colored glass threads (called tesserae) alongside one another so that only the ends of the threads are visible. The placement of the colors determines the image, and the most popular subjects included famous Italian monuments, animals, flowers, etc. 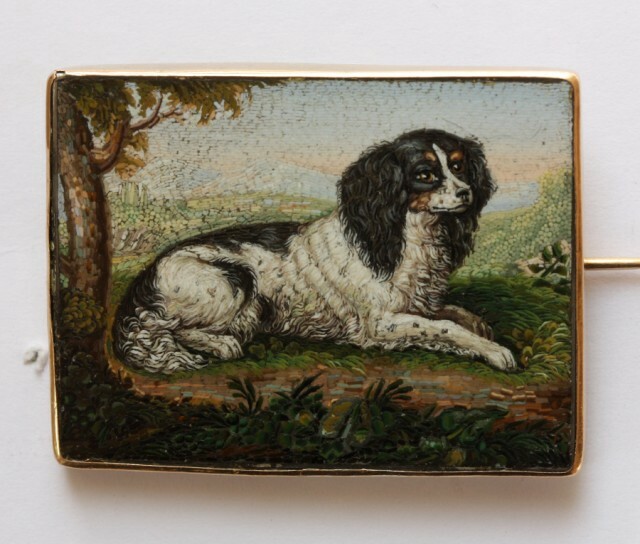 Some of them can be pretty clunky-looking, but others — like this Prince Charles spaniel — are a marvel of fine detail. This one was created and signed by Francescangeli Agostino of Rome, and dates to around 1830. Side note: There’s a contemporary American artist, Laura Hiserote, who’s taken micromosaics to another level. She even creates her own microtesserae — something I got to witness a few years back in a seminar she gave at an antique jewelry conference. First, she chose the particular color glass she wanted, then she fired it until it was molten. From that liquid glass, she pulled out a long glass thread so thin and fragile it resembled a wisp of hair. She then cut that thread into tiny lengths, creating the microtesserae. She actually let us try to place them into a sample piece ourselves, and I failed miserably. I have a pretty steady hand, but this completely defeated me. Here’s a gallery of her work. The top pendant, “Rite of Passage,” contains 16,394 microtesserae. It took her six months just to develop the glass palette, and then a full year to set the microtesserae. Amazing stuff. Queen Victoria was devastated when her husband Albert died in 1861, and she went into a period of mourning that lasted for decades (and in fact only ended with her own death). As her subjects, the English people were required to go into mourning as well — but while their clothes and jewelry were black, each item still featured the detail and embellishment critical to Victorian tastes. It was at this point that Whitby jet really came into its own. Whitby jet is actually the fossilized remains of prehistoric trees, and is only found along a small stretch of Yorkshire coastline near the port city of Whitby (a town also famous for appearing in Bram Stoker’s novel Dracula). Very light and intensely black (hence the term “jet black”), polished Whitby jet has a beautiful glow. It’s also easily carved, so it lends itself well to ornate designs. 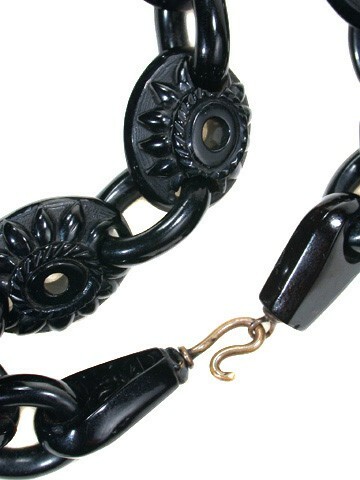 Whitby jet had been used since the Bronze Age for jewelry and decoration, but the onset of mourning after Albert’s death created a huge demand for black jewelry, and sales really took off. Imitations also sprang up, including glass (a.k.a. “French jet”), vulcanite, coal, bog oak, and even plastic. This particular necklace features open oval medallions carved with a stylized floral motif. Oval links of jet join each medallion, and four jet beads flank the large central pendant. Unfortunately, Whitby jet is also fragile, and I once saw a dealer lose her grip and drop a necklace similar to this one onto the top of her display case. Pieces of jet shot all over the booth. It was HORRIBLE. Buccellati is a prestigious Italian jewelry house that is now into its third generation of family designers. Traditionally renowned for bold, textural gold jewelry, Buccellati designs often feature extensive engraving and unusual gemstones. 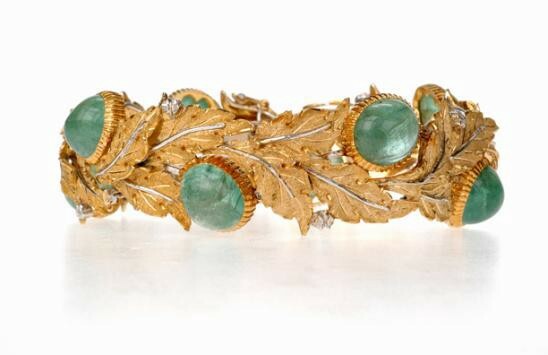 This bracelet is an excellent example: Beautifully crafted leaves of 18k gold are arranged around eight large acorns of cabochon-cut emerald (26-carats total weight). 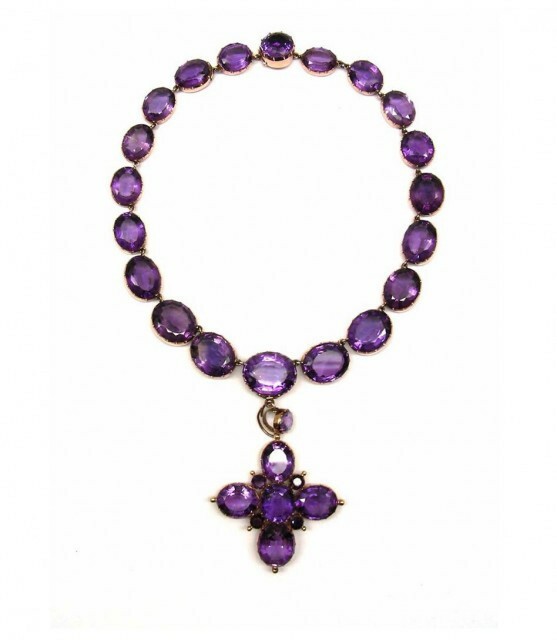 A 19th-century necklace and pendant, consisting of a line of graduated oval-cut amethyst open-set collets (a collet is the thin band of metal that goes around the stone, sometimes with prongs that resemble a crown), suspending a quatrefoil amethyst cross pendant. Circa 1840, the necklace is 15 1/4” long, and the pendant is 2 3/4” high. Gorgeous. Yeah, I’m cheating again by showing you a contemporary piece, but I’m on a big crown kick lately and I want to share. English jeweler Theo Fennell often pairs excellent craftsmanship with a sense of humor and whimsy, and this “Coronet” ring is a good example. 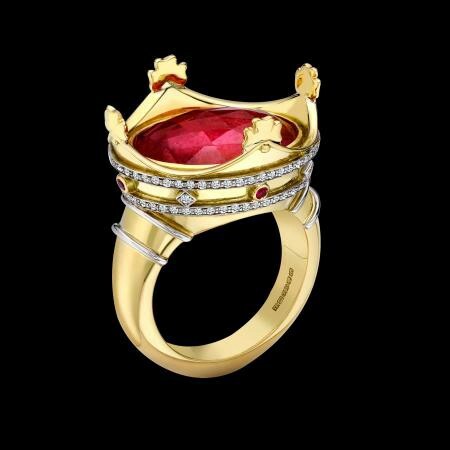 Here he has sunk a vibrant rubellite into a crown of 18k gold, further embellishing it with diamonds and smaller rubellites. A jewelry auction is scheduled for this Tuesday, June 7 (tomorrow! ), at Phillips de Pury and Company in London. They have a nice cross-section of items — including two tiaras, be still my beating heart — so it’s difficult to choose any one thing to highlight, but I’m going to go with this antique necklace. It’s far from the most expensive item in the auction, but I love it for its delicacy. 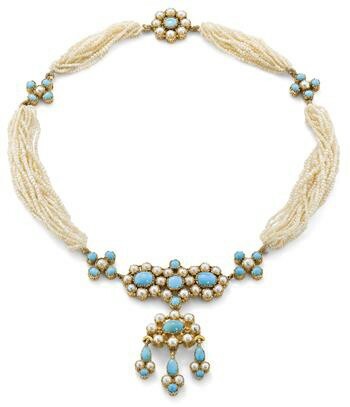 Sixteen strands of seed pearls are grouped into four sections and placed between floral-motif turquoise and pearl spacers, leading to a central floral design of more turquoise and pearl, and a detachable girandole-style (i.e., a central piece with three ornaments hanging below) pendant. Make sure you look at the rest of the lots, though! This is a Georgian (circa 1830) double heart and crown ring. 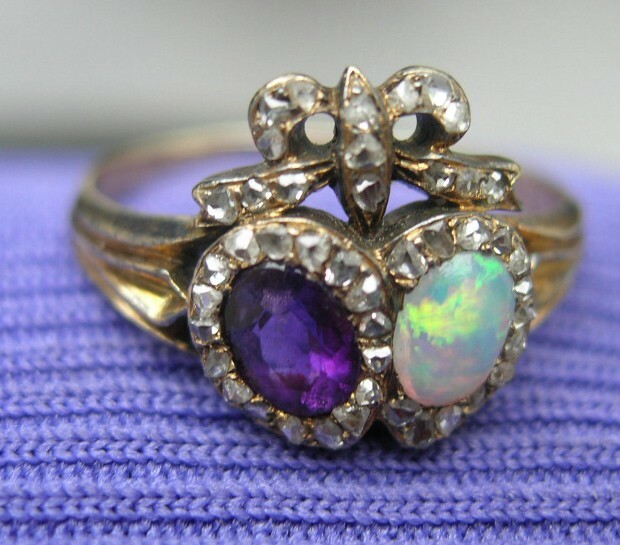 This was a popular style for married or engaged couples, often pairing the birthstones of the man and wife, and this one is particularly unusual because it features an opal, a stone that doesn’t often turn up in rings of this sort. Rose-cut diamonds surround the stones. 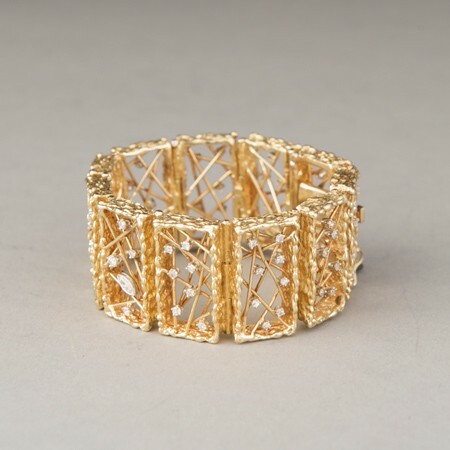 Circa 1970s, a signed, abstract 18k gold bracelet with various cuts of diamonds, by goldsmith Anthony Kim. A little while back, I told you guys about paste stones, and how they were sometimes backed with foil to allow light to reflect back through the stone. Early jewelers also used this technique with crystal and other stones, and sometimes used colored foil to add to the brilliance. 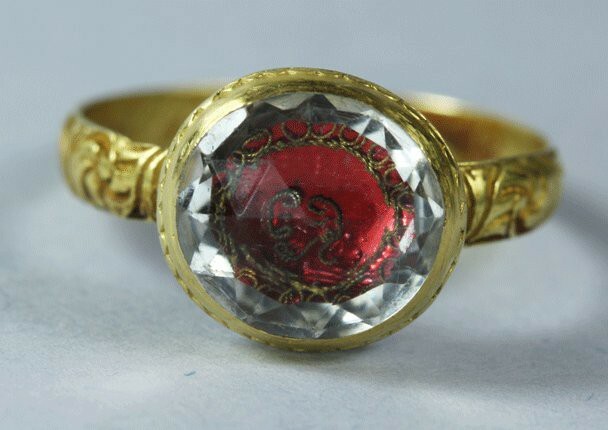 This 17th-century English ring is a great example of that, showcasing a large, faceted crystal backed with a deep, pinkish-red foil and set in gold. The piece features intricate engraving, and shows some areas of black enameling. Beneath the crystal is a twisted gold wire depicting the royal cypher (a sort of a monogram that gives the initials of the name and title of a monarch) of King Charles II (1630–1685), of the House of Stuart, and was probably worn by one of his followers. I can’t resist another tiara. 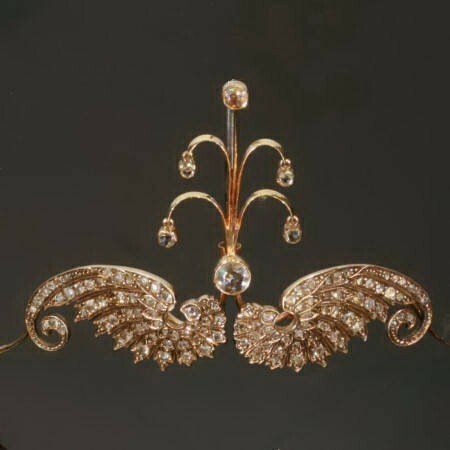 This one is Victorian with Dutch hallmarks, circa 1890, in 18k red gold with 116 rose-cut diamonds. 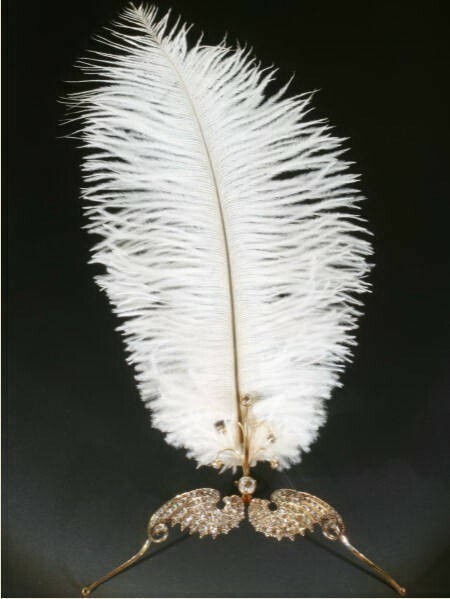 The two wings can be detached to form a brooch, but even better, it comes with both a peacock feather and a white ostrich feather that can each be inserted into a little gold cone at the back of the tiara. Monica McLaughlin just needs to buy herself a crown already. This is ridiculous.